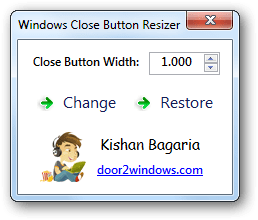 Windows Close Button Resizer is a freeware from door2windows that allows you to resize the width of the close button in Windows 7 & Vista. Just run the tool, set the width and click Change. To restore the default size, click Restore. Apps from door2windows are truly free and DON'T include any offers to install 3rd-party apps/adware/toolbars/unwanted software and never will. The apps are portable and don't require installation. door2windows App Bundle gives you access to all the latest apps released by door2windows in one download (along with future updates). Like this? Share it then! door2windows App Bundle gives you access to all the latest apps released from door2windows in one download.